GN Solids Control is a leading solids control and waste management equipment provider; customers are widely spread in more than 72 countries and regions. GN Solids Control has 2 manufacturing plants in China, now the global market is around 70% and the domestic market is around 30%. Almost all the large oil and gas service providers and drilling rigs contractors are using GN Solids Control products in thousands of drilling rig sites. GN Solids Control has a very close relationship with most of the companies working on solids control and waste management area. 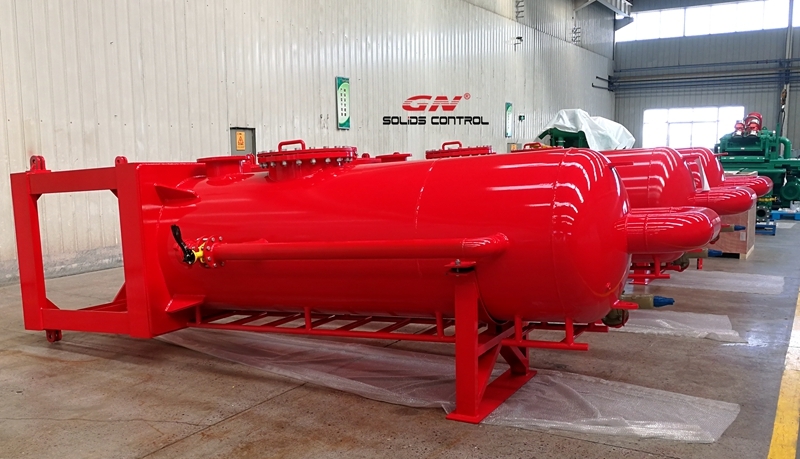 GN Solids Control has provided hundreds of shakers, decenter centrifuges and cuttings dryers to China oil companies. Just several weeks before, GN Solids Control delivered some poor boy degassers and cuttings boxes to Sinopec. As we all know, Sinopec is one the largest oil companies in China, GN Solids Control has been providing solids control and waste management equipment for many years. GN poor boy degasser is mainly used to eliminate large bubbles in the drilling fluid. GN poor boy degasser is composed by a large cylinder, one metal plate is fixed on top of the inner cylinder. Drilling fluid is hit on the baffle plate firmly so the large bubbles will run from the top of the cylinder. GN Solids Control also manufactures vacuum degasser and centrifugal degasser to eliminate finer bubbles. Centrifugal degasser takes narrow room which can be used various drilling rigs solids control systems. Beside the poor boy degasser, GN Solids Control also provides some sets of cuttings boxes to Sinopec. GN Cuttings Boxes are mainly used to collect those drilling waste discharged from shaker, desander, desilter, decanter centrifuge and cuttings dryer. Level monitor is fixed on each cuttings box. In order to watch the leakage, some leaking devices are also fixed in the cutting box.